We have won many awards over the years. Below are just a few of our Achievements since 1988. 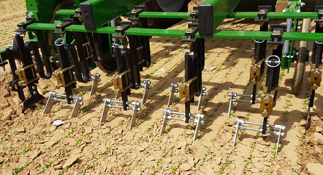 The hoe presented was designed to hoe in 7cm row spacing using specific 4.5cm wide blades and well-controlled working depth with accuracy level of 2cm. 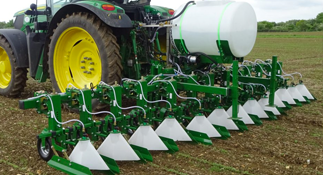 The Garford hoe is ground-breaking in the sense of accuracy to the crop, the Baby Leaf Salad Hoe being able to work in specialised crops with narrow row spacing and being able to gently move the 1 – 2 cm of soil to lightly mechanically weed. With research and development Garford’s succeeded with automatic management of the hoes stabilising features with regards to spacing. Automatic management of camera height, development of the console programme for row picture and analysis. The new 2017 camera to read and analyse as many rows as possible and follow to high accuracy. 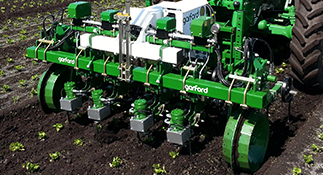 The Garford Robocrop InRow machine was merited in 2011 with a “nomination” at the Innova-Agri exhibition when presented by newly appointed distributor Novaxi. The Innov-Agri show offers exhibitors the opportunity to show their products and services and all the latest innovations and technologies related to agriculture and livestock breeding. Innov-Agri also hold lectures by specialists during the show on topical issues in agriculture. The Innov-Agri show offers exhibitors the opportunity to show their products and services and all the latest innovations and technologies related to agriculture and livestock breeding. Innov-Agri also hold lectures by specialists during the show on topical issues in agriculture. Robocrop InRow means high precision inter-row and also inter-plant cultivation without the necessity of precise mechanical planting thanks to the optical management system based on pixel information comparison by the machine’s computer. The system’s computer analyses the input information that the camera sees in front of the machine and uses this information to horizontally manage the hoes and also to individually synchronise the rotors. Rotor speed is constantly adjusted by the computer to adapt to the plant distance variabilities. After the InRow rotors there are further cultivator units mounted to complete the weed control on the treated surface. Garford Farm Machinery won the exhibitors award for the Robocrop InRow Weeder at the 11th International Fair of Agricultural Technology. The competition is designed for exhibits which are presented at the international fair and parameters of which are comparable to the world’s top quality or which determine the trends of development in their respective fields. The exhibits are assessed by the evaluation Committee consisting of experts in the relevant fields. Garford Farm Machinery Ltd was delighted to be awarded the Queen’s Award for Enterprise in the Innovation category. Garford were independently judged a worthy winner of this most prestigious business award in the UK, for their product Robocrop InRow Weeder. The Queen’s Award is Britain’s most coveted commercial prize and recognises considerable achievement. The Awards were inaugurated in 1966 as The Queen’s Award to Industry but are these days renamed as The Queen’s Award for Enterprise divided into International Trade, Innovation and Sustainable Development. The award was presented to Philip Garford (Managing Director), Michael Garford (Design & Technical Director) and Janet Garford (Finance Director). This revolutionary product will provide a remarkable change to production methods in the vegetable industry. 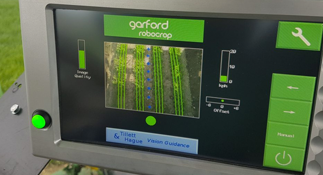 With European legislation eroding the armoury of herbicides available to vegetable growers, which is making profitable production very difficult, the Robocrop InRow Weeder is the first commercial product to use vision analysis techniques to control weed removal between vegetable plants. Robocrop InRow was winner of “Les Trophees Innov-Agri” in the category “mounted and trailed” at the 2010 Innovagri exhibition. The award was presented to M. Richard Dumbrill, Sales Manager for Garford’s French distributor. The jury was won over by a controlled product that meets a real problem never before solved with a real environmental benefit and commented “This product presents a breakthrough that could benefit many other machines”. Garford Farm Machinery was given the ‘Golden Spurs’ Award in the ‘Selection of Novelties’ category. Agribex, the international Fair for Agriculture, Stockbreeding, Garden, Parks and Green Spaces has grown, with the passing years, into a unique event where farmers, contractors, representatives of the supply industry, government representatives and the general public are meeting each other. Agribex is proud to promote innovation and Garford was awarded the most important award and crowned with the ‘Golden Spur’ in the vegetable sector. Their exhibitor, ‘K A Havelaar’ collected the award on their behalf during the Agribex 2009 exhibition. The SIDE, the Committee for the Technical and Economic Orientation of Fedarim, decided, on the advice of experts, to award a golden medal to Garford Farm Machinery during the General Assembly of Fedarim 10 August, 2009. 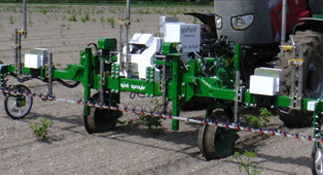 The Garford Robocrop InRow Weeder was awarded the Gold Medal in the 2009 Royal Agricultural Society of England (RASE) Machinery Awards. The weeder also won the Institution of Agricultural Engineers’ Award for machinery that has made a significant contribution to sustainability in agriculture. It is the first commercially available, intelligent, inter-plant weeder. 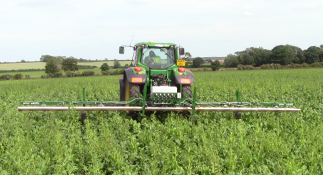 Efficacy rates of up to 98.5% are achievable using the Robocrop and not other form of weed control. The RASE Machinery Awards, which are sponsored by the Institution of Agricultural Engineers, Through The Night and Farmers Guardian, are unique because the results are based on rigorous examination of the machines by commercial users. The Gold Medal is awarded for a machine that is clearly outstanding in terms of innovation, technical achievement and potential benefit to the industry. The LAMMA Trophy for Best new product or innovation in the fields of electronics or information and communications technology. The LAMMA exhibition saw the launch of the Garford Robocrop InRow Weeder for which the first 3 trophies were presented. Philip Garford (Managing Partner) said: “we are proud to be acknowledged for our important contribution towards the needs of today’s vegetable growers, who face a more environmentally focused future”. 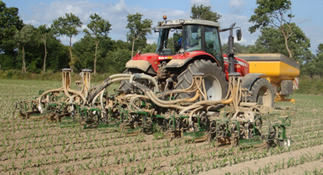 In awarding the IVEL Award, Bill Basford (Institute of Agricultural Engineers), said: “This machine uses a fantastic combination of engineering concepts for weeding plants, eliminating the use of herbicides. It shows that we as an industry do care about our environment”. 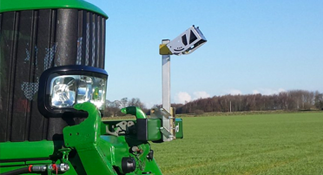 A Silver Medal was awarded to Garford Farm Machinery for the Robocrop Vision Guidance System. This is mainly used for hoe guidance, based on low-cost electronic equipment that `sees’ the crop in the row and fine-tunes the tractor hoe. Forward speeds of 12 kph and outputs of more than 80 acres a day are common. The machine is especially important in field scale vegetable production to reduce dependence on chemicals and in all kinds of organic farming. Garford received the Silver medal for their Skew Bar Topper system. The Skew Bar Topper was noted for its ability to increase harvested yield of any beet harvester by retaining valuable crown material. The Skew Bar Topper is still fitted as standard equipment to the Garford range of Victor Sugar Beet Harvesters. Since 1838, The RASE has played a leading role in the development of British agriculture and a vibrant rural economy through the uptake of good science, the promotion of best practice and a co-ordinated, impartial approach to wide-ranging rural issues. Today RASE’s work includes support for business and social welfare in rural communities, education, and famous shows and events. Since it was granted its Royal Charter in 1840 the Society has aimed to support farming and the rural industries by spreading information about the best in research, development and practice. Today RASE still work to bring the best of British agriculture to the attention of their members and the wider rural industries through shows, events, conferences and awards.